Delhi-Haridwar Kanwar yatra: Why are we making a grand spectacle of religious celebrations in a secular state? The huge Kanwar yatra during the season of Savan has started. Devotees of Lord Shiva will be carrying water from the places known to have an important place in mythology, like Haridwar, Devghar, Varanasi etc, to their homes. The Delhi-Meerut-Haridwar high way is virtually closed for nearly one week to ensure that the devotees are comfortable. On the road from Hardiwar to Delhi, political parties have put huge hoardings to welcome the devotees and camps for them to relax. 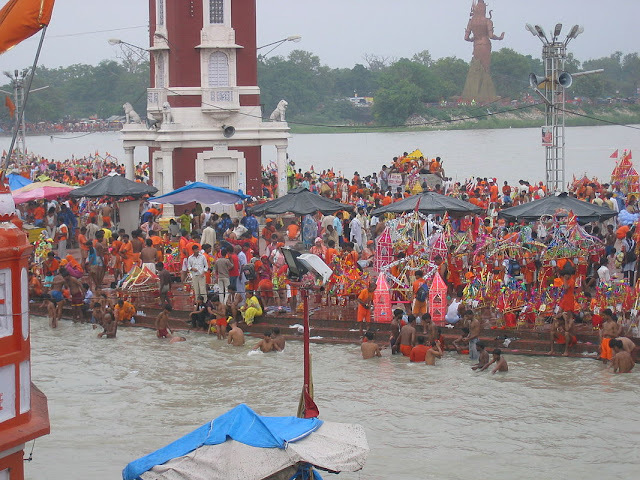 Kanwar yatra is considered to be very auspicious for many people. It was carried out by men only, but with changing times, women too have started participating in it. The highway is packed with pop-devotees, with Bhajans based on latest Bollywood numbers. This is a 'grand-masti' for many who want to get rid of their monotonous schedule of life. During this one week, all the commuters in NCR or Delhi Meerut highway will have severe problems due to restrictions in traffic. In the last two decades, the yatra has been magnified in such a way, as if the yatris are 'deshbhakts' and they are all set fight a war on the border. This clever pattern of making yatris look 'important' and 'brave', such as soldiers, attracts ever more people. While I have no issues with people's personal choices of believing in God, I do have problems with the manner in which these yatras are promoted and encouraged. A new rowdy culture is being promoted, and people fear violence from these Kanwaris whenever any mishap happens. Often strange rumours float around during the yatra. One witnesses strange scenes like a baba wearing over 30 kilogrammes of gold walking all the way -- he is called Golden Baba. This man loves Rolls Royce and other luxury vehicles. We do not how Hinduism, which these people celebrate, allows such persons to be spiritual leaders. If you really love your God, it should be done in a peaceful and dignified way. Even the concept of Shiva should to be celebrated in the way He was, and not the way how political bhakts have converted him into. As traffic snarls, those who are disturbed include senior citizens and the sick. This needs to be seriously looked into. Should any political party promote such activities? Why are we making a grand spectacle of religious celebrations in a secular state? Can't it be personal and without any problems for common people? For next few days one has to be prepared for all the hullabaloo by the Kanwars. Hope some day some sociologist would do a caste-class analysis of this yatra and why it attracts so many of the most marginalised communities. Also, one has to ponder as how do people manage contradictions in India, claiming to be radical, even as doing bhakti. The present government does not recognise 'common people'. People are either with them or against them.